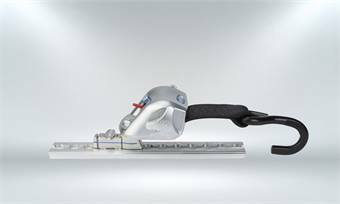 Q’Straint unveiled a new wheelchair retractor tie-down system that meets the higher-strength requirements of WC18 that take effect in December 2015. At that time, compliance with WC18 will require frontal-impact sled testing of the wheelchair tie-down system with the crash-test dummy restrained by a three-point lap/shoulder belt with a lap belt anchored to the 187-lb surrogate wheelchair, such that a large percentage of the wheelchair-passenger restraint forces are transmitted to the rear tie-down straps. The new QRT-360 is the first four-point, heavy duty, fully automatic retractable tie-down system designed, engineered and built to perform successfully in a 30-mph frontal crash when the user of a powered wheelchair is traveling in a motor vehicle while using a commercially available crashworthy lap belt that must be used in the frontal-impact test conducted of wheelchairs under WC19. The new QRT-360 meets RESNA’s (Rehabilitation Engineering Assistive Technology Society of North American) newly revised WTORS standard for effective wheelchair securement well in advance of the 2015 deadline. It also offers a shortened retractor footprint that allows more flexibility in vehicle anchor-point locations to better accommodate large wheelchairs. The revolutionary new product is compatible with the widest variety of wheelchairs and is an acceptable solution to wheelchair securement in all types of motor-vehicles. The QRT-360 design utilizes energy management features and material technologies to deliver the system’s full strength for maximum load capacity. It features an energy-absorbing steel frame, new high-strength 58-mm wide webbing and a fine-adjustment self-tensioning mechanism using 25 high-strength teeth in the retractor locking mechanism. The geometry of the teeth and an innovative new locking bar ensure perpendicular alignment for maximum strength in all tie-down situations. A re-engineered positive-locking Interface in the retractor mechanism contributes to the system’s ability to resist extremely high dynamic loads. The QRT-360 is covered by a comprehensive five-year warranty.